Ironically, I am creating this blog, and writing my first post on Mother’s Day. Is it ironic? Maybe not, maybe it’s just fitting? This blog, after all, is about a homeschooling mommy (me) blogging about mommy things in a home-school life. I could go back to the beginning (homeschooling day #1) and start talking to you about the failures and successes of my official start date (or the unofficial start). But I won’t. I figure the easiest and less stressful approach (sticky note: avoiding stress wherever possible is an art form I want to master) is to begin with what’s going on today. This morning, my youngest daughter who from now on I will refer to as my Kindergarten Drop Out (or KDO) presented me with breakfast – a delicious pb&j and a glass of milk. While I ate, using Fancy Nancy Ooh La La Beauty Day as a guide, she gathered supplies to create a spa. She named it Surprise… something… something… Spa. Ok, I forgot – I’m a horrible mom. She took everything to the bathroom where she washed and conditioned my hair, dried it with a towel, and styled it. Next, she took out the nail polish. At this point, my oldest daughter, My Ballerina noticed what was going on and asked KDO if she could join in. KDO did my nails. MB did my toes. Then, my toddler noticed. He grabbed some nail polish. 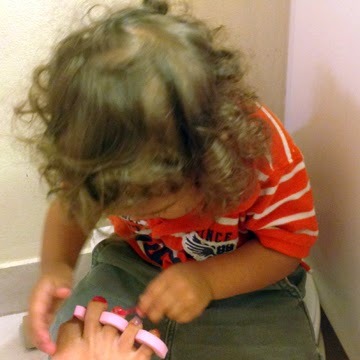 He did the second coating on my toes. You will soon learn that I rarely say no to my kids, however much I’m tempted to, even when they are asking to do something I know they can’t do. More on this in a future post. I promise. Ok, so where was I? Oh yes, the three of them did my makeup. I wore it for a while (around the house) before taking just some of it off to go out to eat. We ate BBQ at a restaurant we recently discovered. I don’t know what people thought or if they noticed. Buuuuut….. each of my eyes had a different combination of colors of eye shadow. I wore a big pink bow on my head and my hair up in a half-up ponytail. 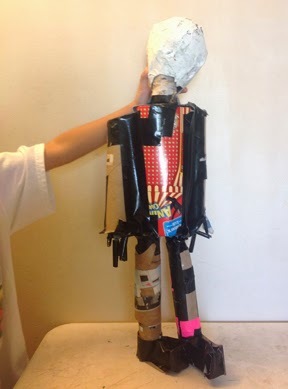 KDO’s piñata was a sculpture of me but isn’t finished so it’s now a sculpture of papi. It’ll be done by Father’s Day, she decided. She even took off the high heels she made for it. So how did Spa Day turn into Star Wars Evening? We have a tradition of making Friday nights ‘movie nights.’ On occasion, we do the same on a Saturdays, especially if we didn’t get to on Friday. On rare occasions, we have movie night on a Sunday, if we get dinner started early enough. Star Wars has amazing behind-the-scenes footage. It really shows the how in movie-making magic and there’s so much of it, hours in fact. There is a scene in the movie where the non-existing environment is actually a painting done by an artist on glass! They explain how the walking motion of elephants was studied by the crew so that they can later try to recreate the same movement with some animatronics. Scenes that are created with stop motion animation. Creation of creatures and costumes. Character development sketches and drawings. The creation of sounds in the movie such as the use of parking meters to create the sound you hear when actors are cocking pistols. They even go as far as showing clips of short movies made by fans and how those fans create their films. They talk about stop animation with clay and show how even kids have created movies using this movie-making technique. There is so much more in just what we watched today. So my tip for the day is… if you have a kid that is interested in movies or maybe you feel watches too much tv and you are having a hard time getting him/her to do something more educational, start with letting him/her check out the behind-the-scenes. See if your child becomes interested in how movies are made. You never know, it might spark an idea or inspire their imagination.